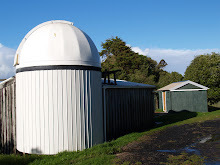 Kumeu Observatory Log: Go the All Blacks! Even though an early morning had been had (watching the All Blacks win the 2015 Rugby World Cup at 5am), the night too was looking "all black" so it was time for Jonathan and I to head out to Kumeu and continue the process. Instead we decided to do a short pointing model run, which would help our ability to "goto" objects accurately, but would also give us a sense of our residual polar alignment error (after only drift testing to there being no noticeable drift after 5 minutes or so). After opening up the some and starting everything up though it appeared we had a strange problem. Even though the last visit the scope had been "synced" and would "goto" reasonably accurately, and the scope had been correctly "homed", the home point appeared to be a long way off. We re-synced it using Canopus and this proved to be a mistake - the next slew commend sent the scope into pointing in completely the wrong direction (and manual joysticking to the target resulted in TheSky telling us we were pointing below the horizon). 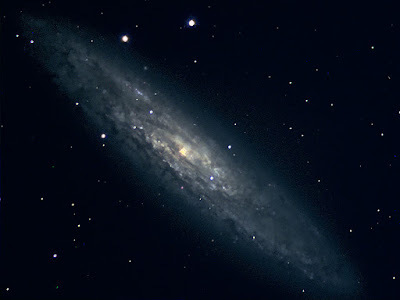 Once we synced again though on a star much further away from the SCP everything went back to normal. We eventually traced the home problem to not having set up the "home position offset" - and once we'd done this the mount worked fine even after a power cycle. We set about doing a short pointing model run, and opted to do this "manually" using the CCD and the jog controls to centre stars across the sky in the centre of the CCD chip. The results quickly converged reasonably well, with us ending up with the stars being much less than 1 arcminute off dead centre in every case. The pointing model also gave us an indication of what error we might have in our polar alignment - and indicated about 4.7 arcminutes out in altitude, and 6.6 on azimuth. In terms of the adjustment to correct this, this is just over a third of a turn of the azimuth adjustment screw West, and just under a third of a turn on the altitude screw high. We pointed the scope at both the Tarantula Nebula (NGC2070) and the Sculptor Galaxy (NGC253) and ran a few images, partly to test the filter wheel and also to produce a pretty picture for the evening! Here's the result - was only 10 frames (2 each RGB and 3 L) unguided getween 40 and 80 sec per exposure. Stacked in DSS and processed in Photoshop.